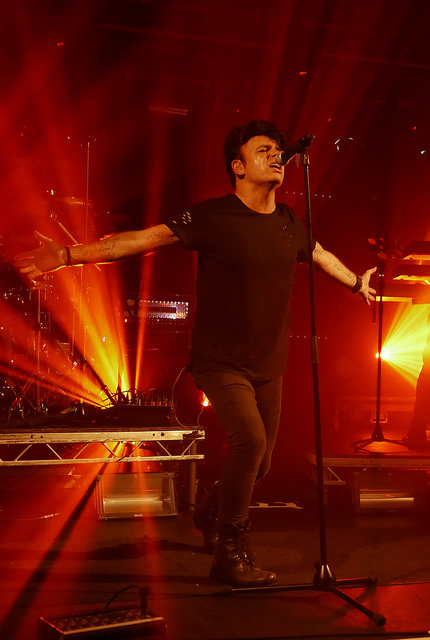 GARY NUMAN / I SPEAK MACHINE – Thursday 22nd September 2016 at the O2 Academy, Oxford. I feel like a bit of a fraud as I enter the Academy in Oxford. On a bit of a spontaneous decision I have a Gary Numan ticket in my hand and it’s quite clear that my limited previous experience of all things connected to the electronic pioneer is nothing compared to the die hard fanatics that are rapidly filling the place. I’ve heard a lot of his work but I’ll admit I actually own very little, my favourite being a live EP featuring the massive hits ‘We Are Glass’, ‘Cars’ and ‘Are Friends Electric’ bought back in ’85 when I was heavily into anarcho punk. I don’t think that’s going to impress anyone here, this feels like a night for the dedicated. 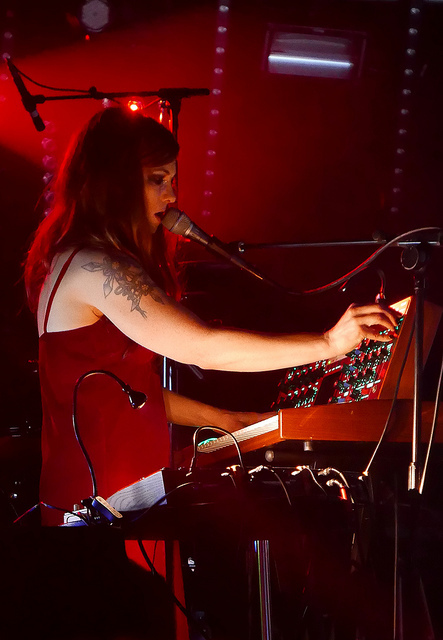 The stage is occupied by a synth set up including a Moog Voyager and a projection screen as I arrive at the front. Soon one half of duo I Speak Machine, Tara Busch appears and creates an accompanying soundtrack while the short films of the other half of the outfit, Maf Lewis, are screened. Zombies and atomic weapons testing, even Numan’s own daughters are some of the subjects while Busch contorts herself and her voice to provide a harsh and hypnotic audio landscape. It’s a brave concept which works well in capturing the attention of the audience and it’s great to see someone doing things differently and pushing the boundaries. 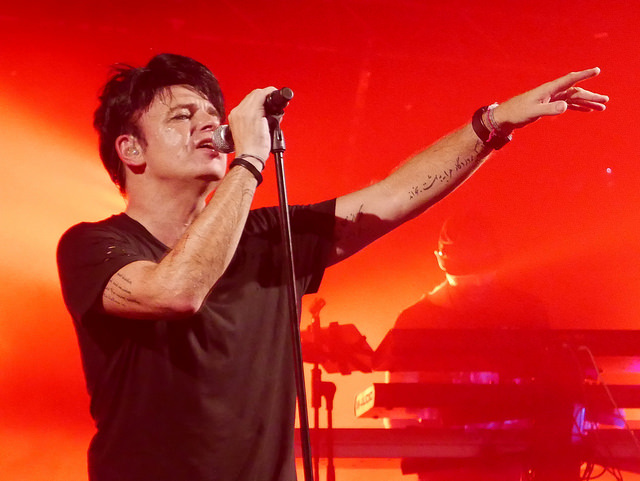 Arriving silhouetted by a strong shafts of backlighting with the sounds of an atmospheric intro swirling around the Academy Gary Numan and the four members of his band take to the stage as the orchestral opening stabs of Replicas pierce the air. Everything grinds through the gears until we’re finally in full motion, those synth laden hooks hanging heavy, going right through you as Numan lays out the sparse lyrics. Tonight is all about key albums in his career – Tubeway Army’s Replicas and the solo follow ups The Pleasure Principle and Telekon. He has said that this might be the last time that he does such a retrospective visit to his past work but it doesn’t feel like nostalgia tonight. The sound of these songs has been updated and mutated over the years into something more contemporary. All the cues are there from 79 / 80 but they feel fresher, heavier and more anthemic than the original recordings. Fifteen songs slip by all took quickly and we reach the holy trinity of ‘We Are Glass’, ‘Are Friends Electric?’ and ‘Cars’. The reaction is incredible and the smile on his face when he delivers the line ‘This means everything to me’ shows that he still loves what he does – you just can’t fake that kind of thing. ‘I Die You Die’ closes the main set before he returns with ‘We Are So Fragile’ and ‘My Shadow In Vain’. I leave with a feeling that I’ve been missing out and that its over, like turning up for the last five minutes of an amazing party just before the lights come up. I’m a convert just at the time when it seems it is all ending. All is not lost though. The next day I investigate more recent offerings such as 2013’s ‘Splinter’ and the Pledge music campaign for his new album. This story isn’t over yet, the new work is stunning, the past may be being put neatly into a box but the future looks bright. 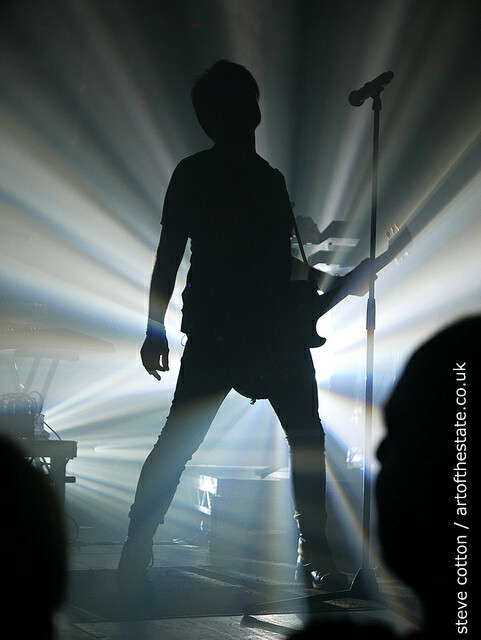 Gary Numan, an incredible set of old classics but plenty more to come in the years ahead.